Never say what you think: The principle reason for this is that religious and philosophical problems are often ones which are contestable. In other words, whatever one person - however eminent they may be - thinks about a philosophical issue or problem may still legitimately be contested. 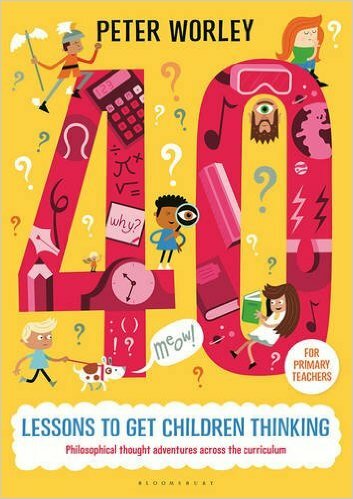 The children will be used to understanding the teacher’s answer as the answer, so if you say what you think, the children may well not recognise that it remains contestable. By contrast, the children will be much more likely to understand what their peers say as so. Never say what the children should think: it doesn’t matter how wrong or how off-track you think someone is. If there are children in the room who disagree with a particular point made by somebody then your job is to engage them with the speaker not to engage with them yourself. Sometimes, when there is unanimity on an issue you may even ask the children to think of an alternative point of view but you must never play devil’s advocate because it is at that point that you are in danger of straying out of your safety zone during controversial discussions; at that point you will have allowed your prejudices, biases, sympathies and opinions to contaminate the discussion. Never answer questions: if questions are asked during a discussion then do not answer them for all the same reasons I’ve given above (I am, of course, not referring to factual questions such as, ‘Do Muslims use the bible?’ but to controversial, contestable, open-ended questions such as, ‘Does God exist, Miss?’). What you should do however, is put the question to the class or group. This is my rule of thumb with any question that is asked during an enquiry. This has the added effect that rhetorical questions become less frequent! For more see ‘Socratic Irony in The Classroom’ (see link above). Never take sides: to help with this I suggest using a strategy I’ve developed for philosophy discussions that I call iffing (framing what a student says in a conditional sentence structure ‘If… then…’ linking what they said to the main question under consideration. This encourages the student and the class to think about any implications or entailments following their idea without the teacher bringing in any content or their own agenda). For example, in a discussion about whether unicorns have one horn or not with some 8-year-old children, one of them said, ‘Unicorns do exist; you just have to be very lucky to see one.’ Now, I don’t happen to believe in unicorns (though, for all the reasons listed above, I won’t say this to the class) and neither did the rest of the class and I could tell because many of them were being (if not about to be) very rude to the speaker. The question we were working with was: ‘How many horns does a unicorn have?’ I calmed the class down, reminded them to be respectful and simply asked (employing the iffing strategy): ‘If unicorns exist then how many horns does a unicorn have?’ A discussion ensued. Then I asked: ‘If unicorns do not exist, how may horns does a unicorn have?’ Another discussion ensued. The iffing strategy here enabled me to deal with this volatile situation respectfully, fairly and fruitfully; they had after all talked about the role existence plays in determining how many horns a unicorn has - an important one as it turned out. You should be able to see the clear parallels here with ‘hot potato’ questions like ‘Does God exist?’ and so on. You’ll also notice how the strategy makes use of the present tense ‘If unicorns exist…’. The implications are altered with the past tense: ‘If unicorns did exist…’ seems to imply that they don’t exist, whereas the present tense remains non-committal. This strategy and others like it help the facilitator achieve the all-important neutrality that distinguishes a facilitator from a student, teacher, lecturer or coach. Never reveal your prejudices, biases, sympathies and opinions: your natural response to this may be that you don’t have any. Well, you do. Everybody does, whether aware of it or not. There may be some prejudices you have that you are aware of but don’t broadcast. All prejudices creep into what we say to a lesser or greater extent and that is why one needs to be especially careful when allowing sensitive and controversial discussions to happen in classrooms. The test: if you want to test how successful you are at facilitating in a non-interfering way then ask someone (it’s better if it’s someone who doesn’t already know you personally) to sit in during one of these discussions. At the end and without having warned them ask whether they could tell what your views on the topic were from your facilitation. If they can, then you need to try to identify what it was that gave you away and to expunge the offending comment next time. If they can’t, then well done: you are now safe to facilitate difficult discussions. If a parent or teacher voices concern about what the implications of doing philosophy are then I invite them to sit in and judge for themselves. If you have done your job well and the parent is still concerned by the fact that the children are critically engaging with topics they would rather they didn’t then the issue is a deeper one between them, the school and the education system. At present, the education system does - and always should - encourage the critical engagement of the students. 'Does God exist?’ is not a question easy to answer, and different people will have different views about it, but one thing that philosophy would maintain is un-contestable is that the view - that God does (or does not) exist - remains contestable. ‘The Question X Revisited’ by Peter Worley: https://philosophyfoundation.wordpress.com/2014/11/12/the-question-x-revisited/ on why closed questions are better than open questions in enquiries. Peter Worley FRSA is the CEO and co-founder of educational charity The Philosophy Foundation, President of SOPHIA – the European foundation for the advancement of doing philosophy with children, and a Visiting Research Associate at King’s College London. Peter is also the author of the best-selling The If Machine, and the award-winning books The If Odyssey and Once Upon an If, for Bloomsbury, as well as the multi-award-winning The Philosophy Shop, award-winner Thoughtings and editor of 2 more books for The Philosophy Foundation Series for Crown House Publishing: Provocations and The Numberverse. He regularly works in schools delivering philosophy sessions for primary and secondary classes and training for teachers.